Los Angeles County, CA - In the span of less than two weeks, judges declared mistrials in two cases involving claims that asbestos supposedly present in Johnson & Johnson's cosmetic talc products caused plaintiffs to develop mesothelioma. The first mistrial was declared on September 24 in a trial that began in mid-August, when despite five days of deliberations and the substitution of two jurors using alternates by Judge Margaret Oldendorf, the panel informed the court that further deliberations would be hopeless. That trial was recorded gavel-to-gavel by Courtroom View Network. Judge Stephen Moloney declared the second mistrial on October 2 after two days of jury deliberations. Both plaintiffs, Carolyn Weirick and and Kirk Von Salzen, were represented by attorneys from Texas-based Simon Greenstone Panatier Bartlett PC. They asked jurors in Weirick's case to award $29 million plus unspecified punitive damages as compensation for her mesothelioma, which she claims was caused by years of inhaling asbestos fibers supposedly present in Johnson's Baby Powder. J&J maintained their testing confirmed their talc products contained no asbestos, and that exposure to talc does not cause mesothelioma. Two other J&J talc trials ended in mistrials this year, one in South Carolina after the jury deadlocked, and another this summer in Los Angeles after the plaintiff passed away. Closing statements in another ongoing talc trial in J&J's home state of New Jersey are set for October 9. J&J's talc supplier, Imerys Talc America, was originally a co-defendant in Weirick's case. Imerys participated in the trial until the beginning of jury deliberations, when they struck a confidential settlement to exit the case. Imerys also settled out of the ongoing trial in New Jersey just prior to opening statements. 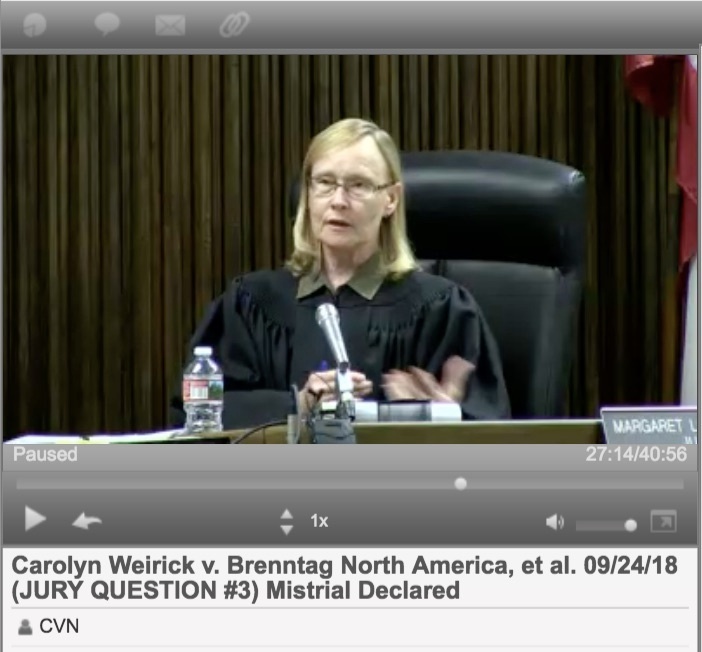 The case are captioned Weirick v. Brenntag North America, et al., case number BC656425, in Los Angeles County Superior Court, CA before Judge Margaret Oldendorf and Salzen, et al. v. American International Industries, et al. no BC680576 before Judge Stephen Moloney.